Access Desires is a provider of comprehensive web marketing services that range from SEO | SEM services. Apart from website design, Search Engine Marketing (SEM) also enables supplementation of the "search-ability" of your website in Singapore. In comparison to traditional advertising mediums such as television and print publications, Google Advertising provides a highly budget-friendly alternative. You simply pay for each click or visit to your website, with a click costing as little as 20 cents. Google Advertisements selectively advertises to those who are already searching for the product or service you’re selling. SEM permits you to provide them with their ideal matches, and thus turn them into customers without additional difficulties. On doing a Google search with a few relevant product/service keywords, you’ll come to find that your competitors are already leveraging on SEM to get a hold of different businesses from you. Stay visible in the industry, and remain ahead of the competition, only with search engine marketing. Thanks to SEM, your website pops up each time potential clients search for your products or services, on any of the major search engines including Google, Yahoo, Baidu and Bing in Singapore. Most of the major search engines such as Google, Yahoo and Bing are accountable for over 90% of all search engine traffic. SEM allows you to capitalise on these major online players, and obtain the maximum possible exposure for your business. 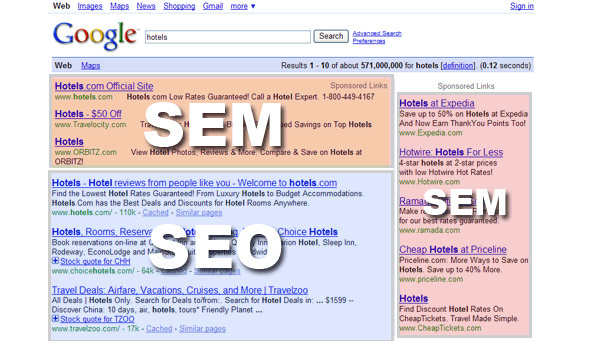 SEM is highly-measurable in combination with Google Analytics, and you can measure the effectiveness of the results. If an SEM campaign is crafted well, can bring you results in just a week or less.